Of course, I’m fascinated by hypnosis. I’ve made a career out of it! And I get so much satisfaction from teaching others all that I know about hypnotherapy. I get calls and emails from lots of different people around the world with questions about hypnosis. 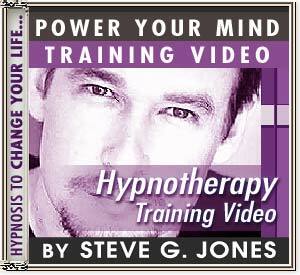 Several years ago I hired a production crew to create a video where I teach the basics of hypnotherapy. In this video I talk about the different components of a hypnosis session. I discuss the induction, deepening, script, amnesia, and trance termination. These are the five steps to a hypnotherapy session and they all involve different things. Convenient and effective training designed to help you master the art and science of hypnosis. Learn from the master himself how to do it safely and correctly. See Dr. Steve G. Jones M.Ed. demonstrate the techniques of hypnosis on clients in his office. Training also includes a discussion of each technique and homework assignments.